During menopause, there are many changes taking place in both your body and your mind. This can be a time where you suddenly feel unhappy either with yourself or your life. The emotional slump can be so deep that your body will start to show negative symptoms as well. The grip of depression is strong, so it helps to be aware of what symptoms to be alert for. During those moments of lethargy, fatigue, or tears, it's important to remember that this is a normal reaction to menopause that is temporary and can be overcome. Having the blues can just make you feel down in general. This will cause a lack of energy, determination, or willingness to do the things you love to do. At work, your mind may be too mentally fogged to concentrate on your tasks. On your weekends, a lack of enthusiasm may make you want to lay in bed instead of going out with others or partaking in your hobbies. In addition, your condition may cause loss of libido due to bodily exhaustion, potentially causing tension with your significant other. The fatigue can be due in part by the fact that you have not been getting adequate rest at night. Depression can result in disturbed sleep patterns, such as insomnia. You may notice that it is harder to stay asleep at night, you wake extremely early in the morning, or you excessively sleep throughout the day. While a quick power nap is healthy, sleeping for hours in the middle of the day can signify depression. Depression can cause an individual to make unhealthy dietary choices. They may crave unhealthy foods, like salty, fatty, or sugary foods. On the other hand, they may not eat enough, or the food they do eat may not have a high nutrient content. The lack of nutrients, overeating, and under-eating can cause significant weight loss or weight gain, which can be a strong indicator of depression. The body and the mind are strongly linked. Hormones such as estrogen can be extremely impacted by depression and cause your body to alter or delay your period. Menstruation can be greatly mood-related, so if you have spent an extended period of time experiencing symptoms of depression, you may notice changes. Headaches can develop from stress that builds up through the changes in your body due to menopause and depression. Tension headaches can occur when an individual has sustained and tightened muscle contraction in the head or neck due to worry. In addition, when the neurotransmitters dopamine and endorphins are low, as they tend to be when you are depressed, it can affect how you experience pain, making a minor headache feel worse. Although depression can be difficult, upsetting, and painful, there is help available. 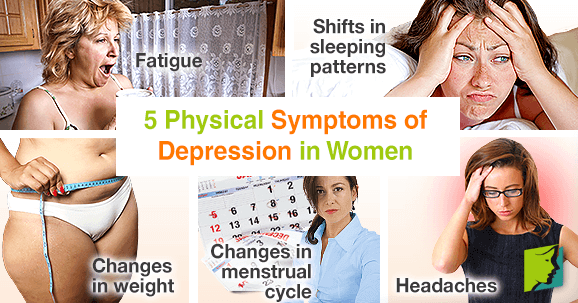 These symptoms are increasingly common during menopause, but you can talk with a counselor, psychiatrist, and loved ones to support you and guide you. If you are having thoughts of suicide or hurting yourself, seek medical attention immediately - no one will judge you, and you are deserving of help.